OK. So you booked your pet-friendly hotel with petswelcome.com. Well done! But now you need to get where you’re going with your pet. And there’s 3,000 miles of ocean between you and your hotel. Or a lot of road and traffic. Or you don’t want to spend 30 hours driving with your cousin who, whenever he sits in the backseat of a car, insists that everybody sings in unison the theme songs of his favorite 1960s TV shows, like F Troop and Bewitched and Hogan’s Heroes. The whole trip. So a plane, then, is really your only option because sanity is essential, if only when you’re on vacation. Most people feel that it’s next to impossible to take their pet on a plane when, in reality, it’s largely a matter of being well informed. While we do not recommend you take your animal on a plane (except as carry-on baggage), we know that sometimes you may not have a choice. Unfortunately, if you own anything larger than a small dog, you cannot take it in the cabin. 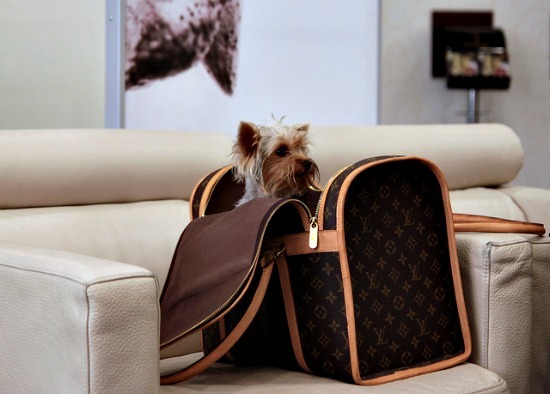 This means your pet has to travel as checked baggage or cargo. Not a great option. But, whatever the case, knowledge is power and so we’ve gathered as much information as possible from all the major airlines so that you will be familiar with their particular rules and policies. These are the airlines for which we have pet policies covered on PetsWelcome so far – we’re working on expanding this list, so if the airline you want to see listed isn’t here, please let us know! Never sedate your pet on a flight. High altitudes and sedatives are a dangerous combination and should never be mixed. Always have your pet’s leash and collar easily accessible for walking prior to departure, but do not take the pet out of the kennel inside the airport. Identification tags for your pet and travel kennel, including pet’s name, home address and phone number, are essential. Never use a muzzle on your pet during travel, as this is dangerous to the pet. Familiarize your pet with the kennel prior to the trip so that it is comfortable to him/her at travel time. Always make advanced reservations or arrangements with the airline when you are making your own reservations. The airline always reserves the right to refuse travel if there are too many pets on board, so make sure you advise them early. Whether your pet will travel with you in the cabin or as checked luggage in the cargo area (this will be primarily determined by size), your pet will need to be contained in a dog crate or cat carrier for the entire trip. Most pet supply stores carry both soft-sided (for in cabin travel) and hard-sided kennels approved for air travel. Additionally, the airlines also sell kennels at the counter. As always, check with the airline first to arrange for this purchase. It is important that your pet can stand, sit, turn around, and lie down comfortably throughout the flight. Need information on pet travel on airlines. What airlines take dogs in cargo?